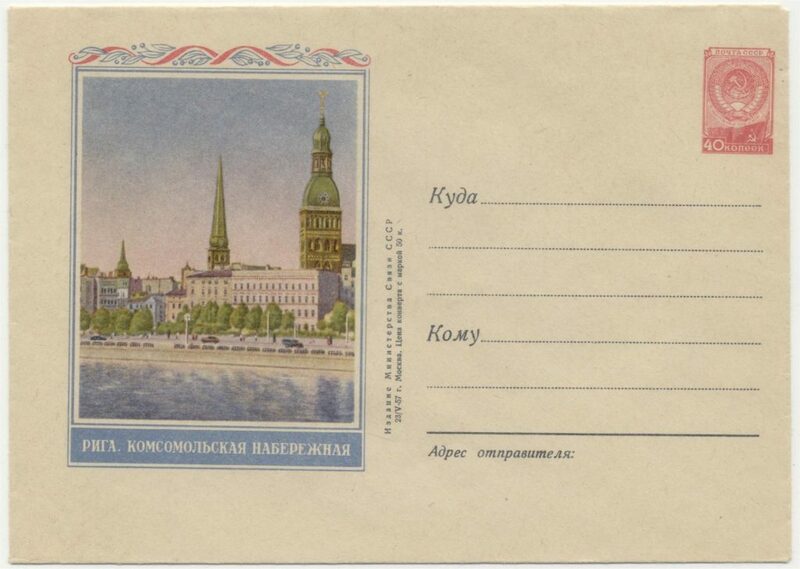 In the former Soviet Union, an enormous number of postal stationery – envelopes with imprinted stamps – with a motif from the Baltic states have been issued. The official issues of the Russian Ministry of Transport in Moscow were printed in the state printing office “Gosnak” in Perm (in the Urals). The description of the picture – the Opera and Ballet Theatre in Riga- is only in Russian. Later envelopes have also a description in Latvian. The printing data are placed on the back of the later issued envelopes. In the period 10-06-1950 – 01-09-1957 the rate for a domestic letter was 40 kopecks. 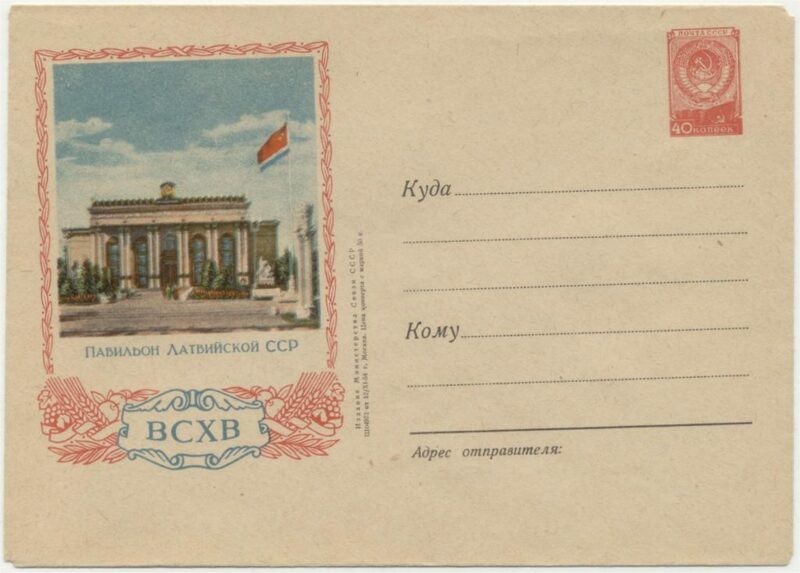 As indicated here in the printing data: the price of this envelope was 50 kopecks. The printing data are still on the front. Latvian fair pavilion in Moscow: Vystavka Dostizheniy Narodnogo Khozyaystva (VDNKh) Russian: Выставка достижений народного хозяйства, ВДНХ. Established in 1935 as Agricultural Exhibition of the Entire Union. The exhibition buildings were built in the period 1935-1939. Between 1948 and 1959 everything was renovated and in 1954 the first exhibition was held since the war. Still as an agricultural exhibition. In 1959 the park was renamed: Exhibition of achievements of the national economy ( Russian: Выставка Достижений Народного Хозяйства , Vystavka Dostizheniy Narodnovo Khozyaystva) of ВДНХ / VDNKh . In 1992, VDNKh was renamed in the new acronym VVC and in 2014 the old name returned: ВДНХ / VDNKh. Riga, Komsomol quay. The printing data are still on the front. The right quay along the Daugava is in Soviet times ‘КОМЪЯУНАТНЕС (KOMSOMOL) КРАСТМАЛА (KRASTMALA = Latvian for ‘quay’)’ called. This is more a transcription of the Latvian designation, ‘Komjaunatnes krastmala’. In 1930 many streets (Gutenberga, Mazā Peldu street, Daugavas quay, Brēmiešu street and the old market place united in one street, which in 1934 is renamed as the 11 November boulevard: ’11 novembra krastmala’. This day is a Latvian anniversary, ‘Lāčplēša-day’. On November 11, 1919 after a bloody battle the Germans were expelled by the Latvian army and the Latvian flag was hoisted over the Riga castle. The memorial day, on which the heroes of the First World War and the freedom fighters of Latvia are commemorated, is named after the Latvian epic hero Lāčplēša. In 1940 it became Daugavas Krastmala and then during the German occupation Daugavmale. After the war the devastated port was built further away from the city center and – in honor of the youth who had restored the quay, the name of the quay in 1948 became Komjaunatnes Quay. In 1990 the old name of the quay returned: 11 Novembra Krastmala. The printing data are still placed on the front. From the end of 1957 (probably October 1957) the printing data are placed on the backside. 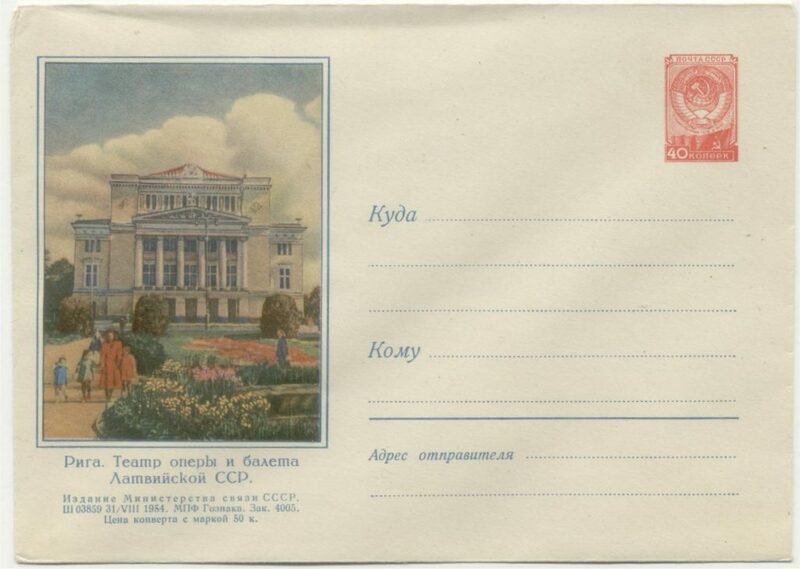 Between 1953 and 1974 the copyright notice is as on this envelope: ИзданиеМинистерства Связи СССР, Publication of the Ministry of Communications of the USSR. The publication number starts with a character: in 1953 and early 1954 the character A, in 1954 this became the character Ш and this remained so in the 1950s. So we see on this enevelope also Ш with the publication number. Then follows the indication от, of, with the date. 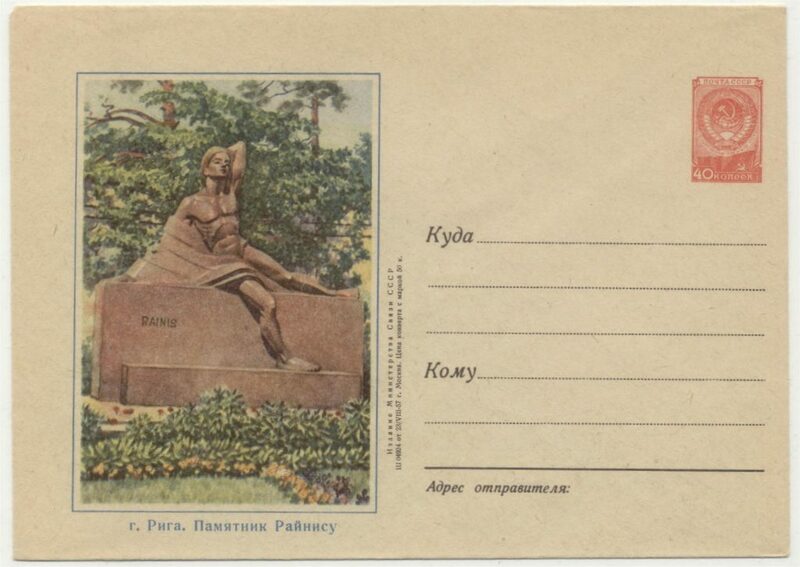 With older envelopes, like this one, the date ends with г., according Reichman the abbreviation for год, year. This designation disappeared at the end of 1978 and after 1979 we no longer encounter it. Envelopes with the indication г. are almost always printed by the Moscow Typographic Factory. 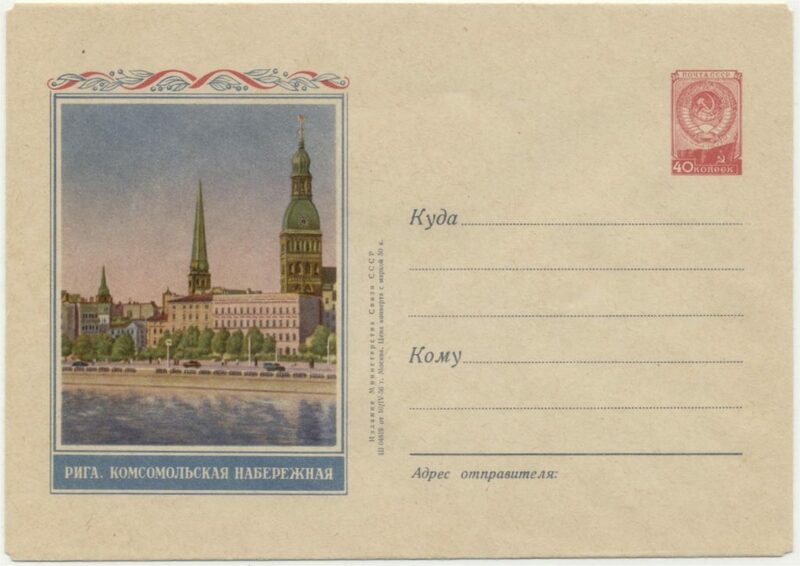 The character г. can also be the abbreviation for город, city, city of Moscow so on this envelope. 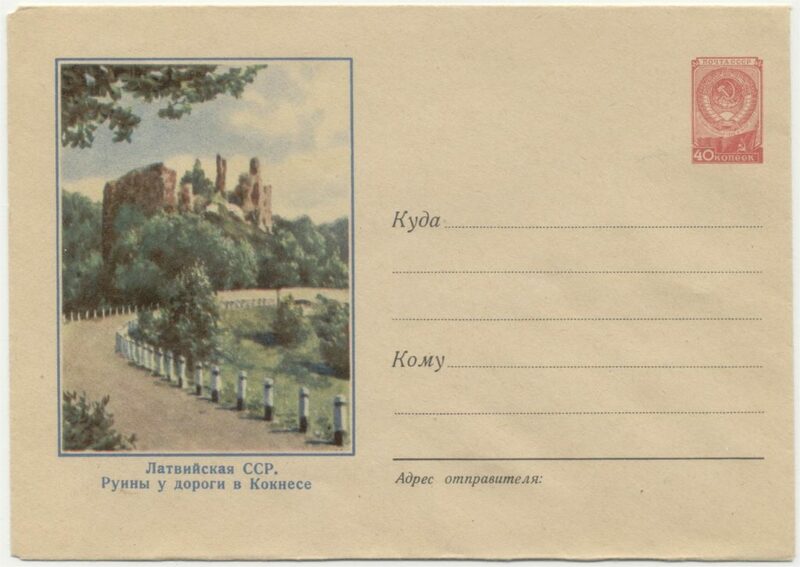 Finally, the price indication: Цена конверта с маркой, price of the envelope with imprinted stamp, 50 kopecks for this envelope.